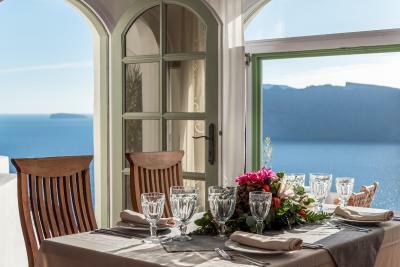 Lock in a great price for Fanari Villas – rated 9.1 by recent guests! It was the perfect combination of quaint and luxury. Got a real feel for the island. Loved location & staff!! We loved our stay at Fanari Villas during our minimoon. 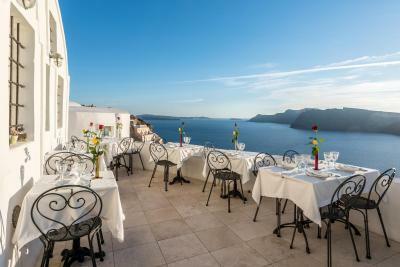 The location is fantastic, tucked away a bit from the tourist crowds that march through the streets of Oia every day. 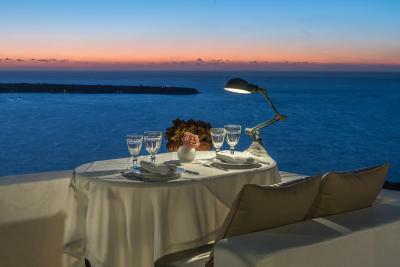 Plus you can watch the famous sunset right from your patio. 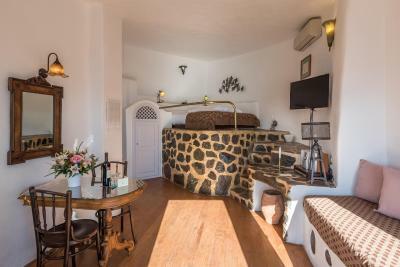 The cave type rooms are very cosy and lovely furnished and we had our own little hot tub and there is a lovely pool and sun terrace for everyone. 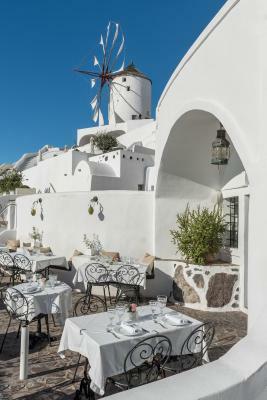 The staff was super helpful, arranging a transfer to our next hotel, giving us fantastic recommendations for dinner places or for more quiet streets in Oia. 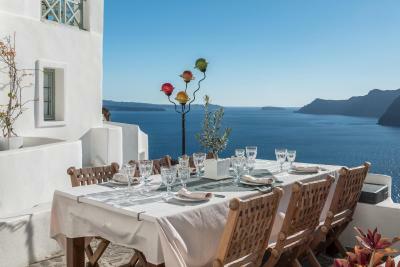 Brilliant location, Nikolas our host was awesome, super nice, very helpful all of the time, excellent customer service. Rooms very clean and comfortable. Hope to come back someday. 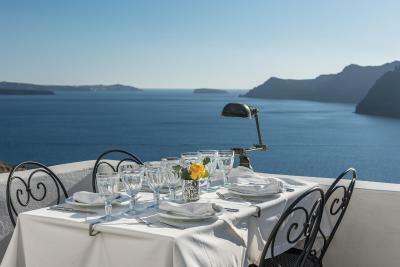 The breakfast could be better, everything else was perfect (hotel staff, rooms, view). The location was perfect. 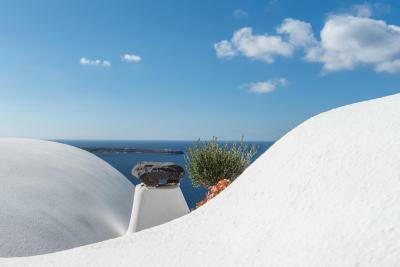 Oia is the most beautiful spot in the island. 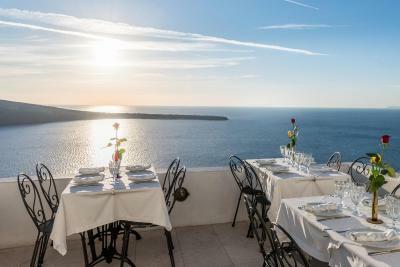 Perfect location to watch the sunset in Oia - you can see the sunset from your own terrace and enjoy the hot spa at the same time. 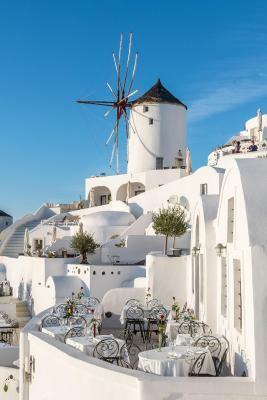 The view from the terrace is spectacular, overlooking the Aegean sea and you can see the windmill as well. The room is spacious and clean, love the decoration of the room. The staff is extremely friendly and helpful. They answered all the questions before the trip and arranged taxi transfer and even booked ferry tickets for me. There is a porter to carry the luggage for you from the parking site so you don't have to climb all the steep stairs with your luggage. There is a nice swimming pool and sauna. The breakfast is good too. Even though it's an expensive hotel, it's so worth it! Really wish we could have stayed longer. La vue, superbe, notamment sur le coucher du soleil. L’etablissement Est calme, chambre spacieuse, simple et belle, très propre. Également super terrasse de la chambre. 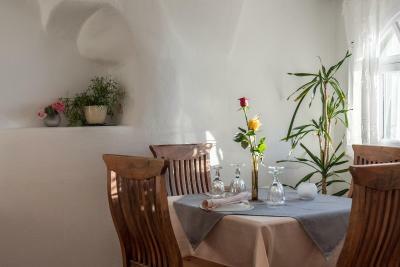 Le personnel très sympa, de bon conseil, et le restaurant de l’hotel Très bien (plats raffinés et prix au dessus de la moyenne). Fanari Villas This rating is a reflection of how the property compares to the industry standard when it comes to price, facilities and services available. It's based on a self-evaluation by the property. Use this rating to help choose your stay! 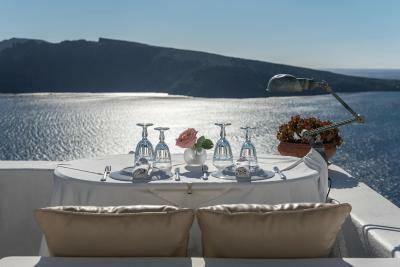 Fanari Villas is a multi-level complex built on a cliff, with views of the caldera, Thirasia island and the sunset. 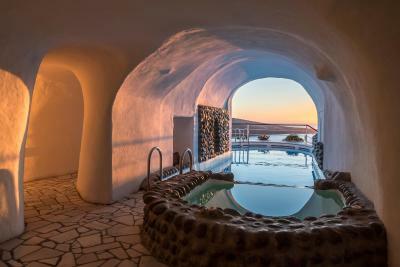 It features suites carved in the rock and offers wellness treatments. 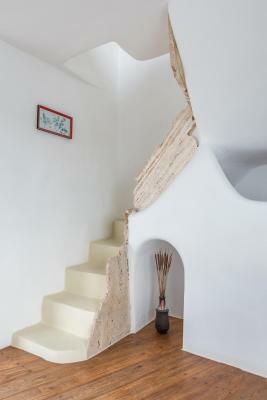 Suites feature arched ceilings and handcrafted, wooden furniture. CD players and free Wi-Fi are standard. Laptops can be provided upon request. Each unit has a special seating area, in some separated from the bedroom. 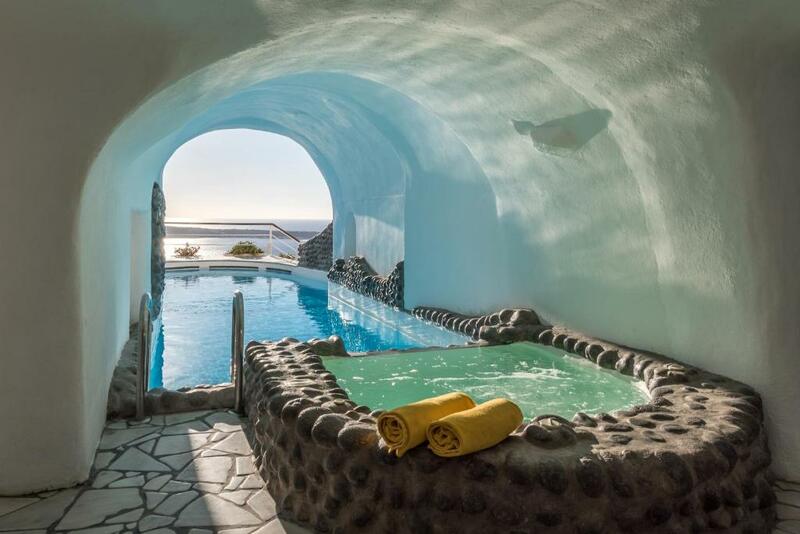 Some suites have private spa baths. The outdoor areas feature curved rooftops and terraces with bougainvillea flowers. 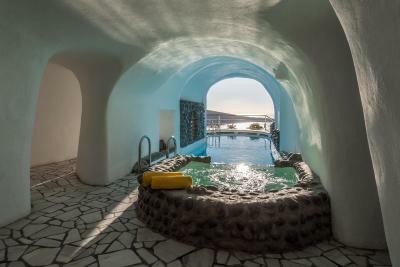 Half of the swimming pool is open-air and half is enclosed in an arched cavern with a hot tub. 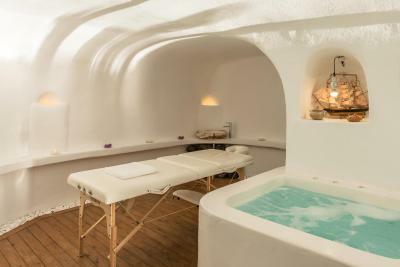 Wellness options at Villas Fanari include massages, facials and hair-dressing appointments. A sauna is also available. 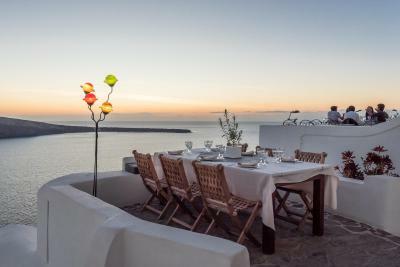 The restaurant serves local cuisine with a modern twist. Meals are also served in the suites. The Sun Spirit Café-Bar serves refreshments and snacks. A buffet breakfast is served daily. 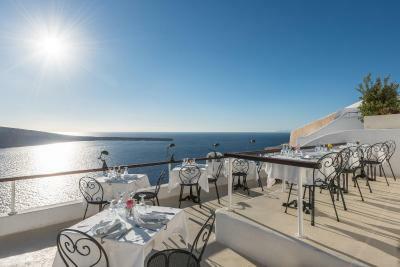 The center of Oia is a 5-minute walk from Villas Fanari. 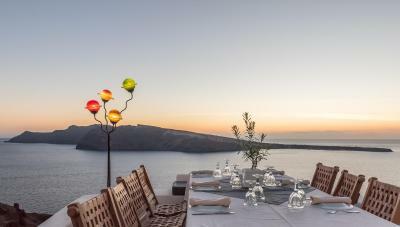 The Prehistoric Settlement of Akrotiri and Ancient Thira are at 13 mi. Free private parking is possible on site. 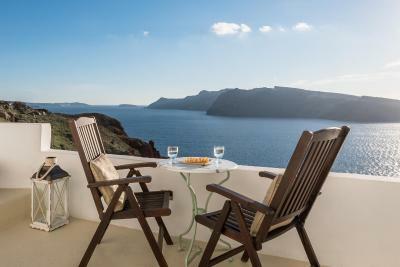 When would you like to stay at Fanari Villas? 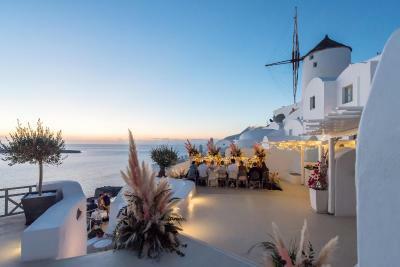 Boasting an outdoor mini whirlpool, a private dining area and rooftop terrace, this honeymoon suite offers panoramic views over the Aegean Sea, the Caldera and the Volcano. It has a master double bedroom, a living room with double sofa bed, and a bathroom with bathtub. Facilities include Apivita toiletries, bathrobes, slippers and pool towels. A laptop can be provided on request. 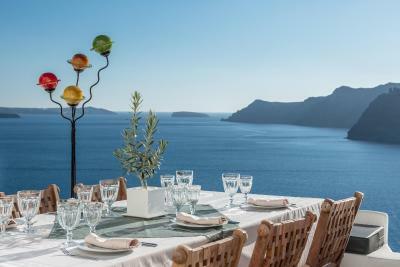 Guests are offered free mini bar consumption and daily fresh fruits and tea/coffee facilities. Sparkling wine and flowers are offered upon arrival. 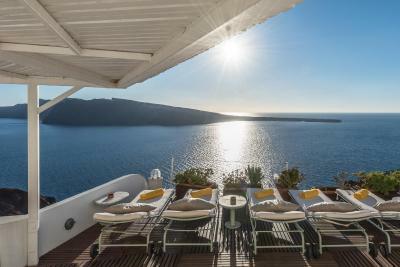 Offering views over the Caldera and the Aegean Sea, this junior suite has a double bedroom with seating area and bathroom with bath or shower. Facilities include Apivita toiletries, bathrobes, slippers and pool towels. Water, wine, fresh fruits and coffee/tea products are offered upon arrival. 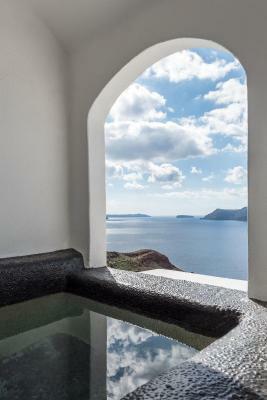 Featuring an outdoor mini whirlpool, this suite offers views over the Caldera and the Aegean Sea. It has an open-plan bedroom with seating area and sofa bed, and a bathroom with shower or bathtub. 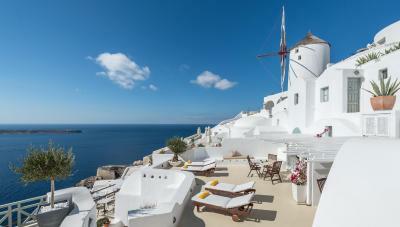 Facilities include Apivita toiletries, bathrobes, slippers and pool towels. Water, wine, fresh fruits and coffee/tea products are offered upon arrival. Consisting of 2 adjoining units, this suite features a spacious courtyard and an outdoor mini whirlpool. 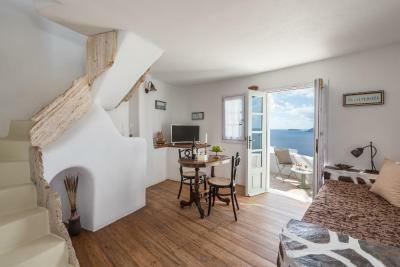 It includes 2 double beds, a living room with 2 single sofa beds, and 2 bathrooms with shower. Facilities include Apivita toiletries, bathrobes, slippers and pool towels. Water, wine, fresh fruits and coffee/tea products are offered upon arrival. 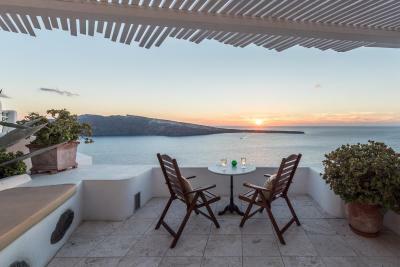 Consisting of 2 adjoining units, this villa features a spacious terrace, 2 outdoor whirlpools and views over the Caldera and the Aegean Sea. 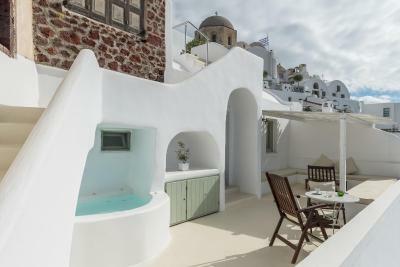 It includes 2 double beds, a living room with 3 single sofa beds, 3 bathrooms one of which has a spa bath. 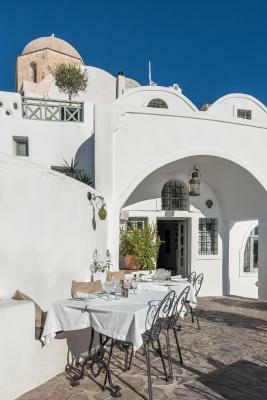 Facilities include Apivita toiletries, bathrobes, slippers and pool towels. Water, wine, fresh fruits and coffee/tea products are offered upon arrival. 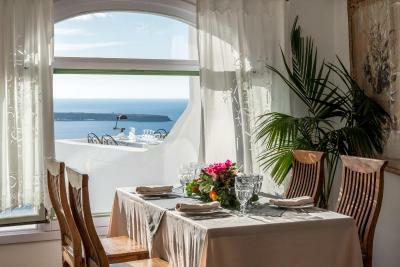 Please note that this room type can accommodate up to 7 guests. 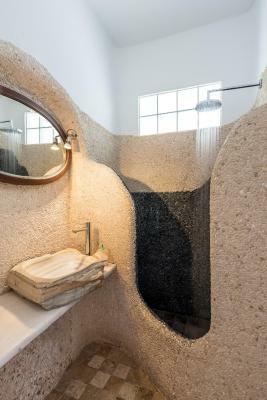 Featuring an outdoor mini whirlpool, this studio has an open-plan bedroom with seating area and a bathroom with shower. 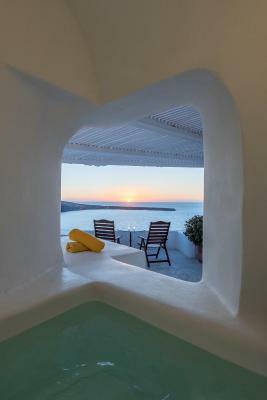 Facilities include Apivita toiletries, bathrobes, slippers and pool towels. Water, wine, fresh fruits and coffee/tea products are offered upon arrival. 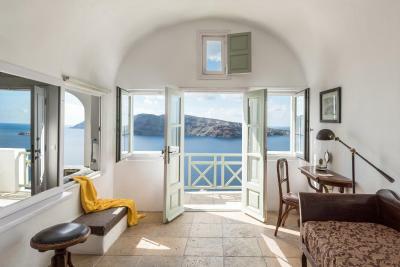 Featuring a private patio with an outdoor mini whirlpool, this executive suite offers views over the Caldera and the Aegean Sea. It consists of a master bedroom with double bed, a separate living area with a built-in sofa bed and a double sofa bed and 2 bathrooms with shower. Facilities include Apivita toiletries, bathrobes, slippers and pool towels. Water, wine, fresh fruits and coffee/tea products are offered upon arrival. Please note that this room type can accommodate up to 5 guests. 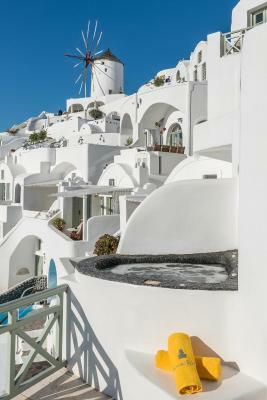 Featuring a terrace with an outdoor mini whirlpool, this senior suite offers views over the Caldera and the Aegean Sea. It has an open-plan bedroom with seating area, and a bathroom with shower. Facilities include Apivita toiletries, bathrobes, slippers and pool towels. Water, wine, fresh fruits and coffee/tea products are offered upon arrival. 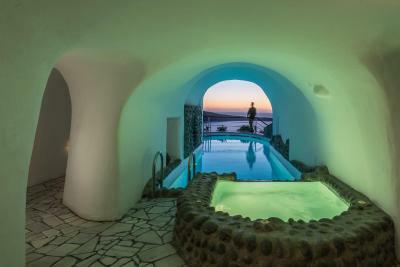 Boasting an indoor cave-style whirlpool, this honeymoon suite has an open-plan bedroom with living area, and a bathroom with shower. Facilities include Apivita toiletries, bathrobes, slippers and pool towels. A laptop can be provided on request. 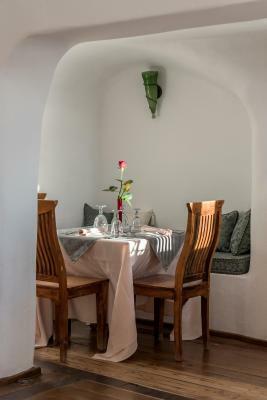 Guests are offered free mini bar consumption and daily fresh fruits and tea/coffee facilities. Sparkling wine and flowers are offered upon arrival. Featuring an outdoor mini whirlpool and 2 patios, this honeymoon suite consists of a master bedroom with double bed, a separate living and area with a single built-in bed and a double sofa bed, and a bathroom with shower. Facilities include Apivita toiletries, bathrobes, slippers and pool towels. A laptop can be provided on request. Guests are offered free mini bar consumption and daily fresh fruits and tea/coffee facilities. Sparkling wine and flowers are offered upon arrival. Please note that this room type can only be accessed via stairs. 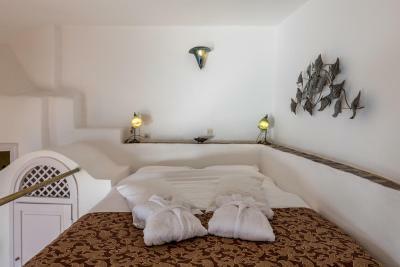 -the second suite has an open-plan bedroom with seating area and a bathroom with cave-style shower. Facilities include Apivita toiletries, bathrobes, slippers and pool towels. Water, wine, fresh fruits and coffee/tea products are offered upon arrival. 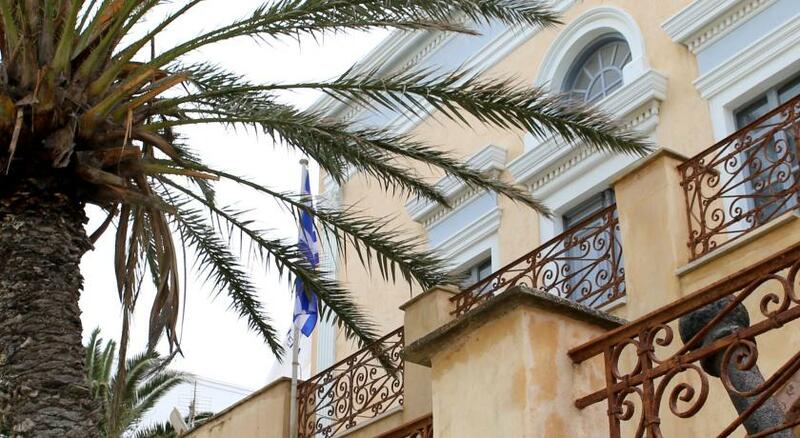 House Rules Fanari Villas takes special requests – add in the next step! 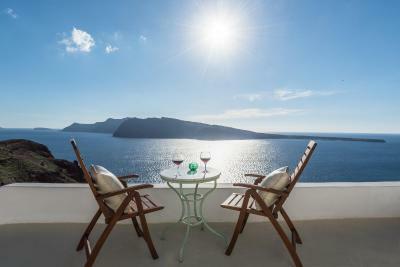 Fanari Villas accepts these cards and reserves the right to temporarily hold an amount prior to arrival. Guests are advised to contact the hotel upon arrival to get assistance with luggage and transfer since access to the property is via stairs. Kindly note that the property does not accept UnionPay credit cards. 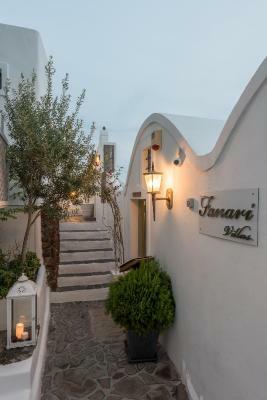 Please inform Fanari Villas of your expected arrival time in advance. You can use the Special Requests box when booking, or contact the property directly using the contact details in your confirmation. 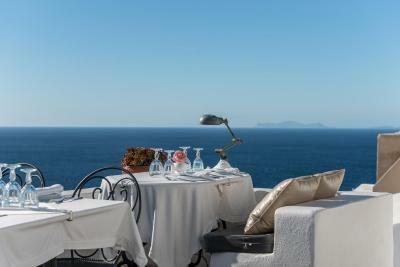 The breakfast buffet was a bit underwhelming in terms of choices and quality of the food and considering the price of the suite, we would have hoped that breakfast is served on our patio. Upstairs on the terrace there was no sound proofing.